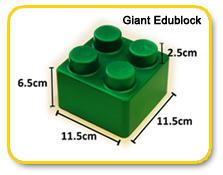 They come in mixed colours made up of red, yellow, blue and green blocks and are made from EVA foam, so they are light and soft to handle. For dimensions please refer to images. 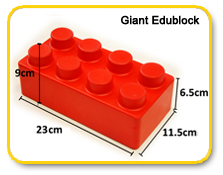 Although the configuration of our boxes are different to other 84 piece boxes on the market (and in our opinion provide much better play value) we guarantee you will not find them cheaper elsewhere. If you do then we will happily price match them. 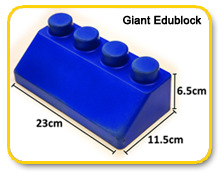 41 PIECE SET (GIANT BLOCKS)Made up of 13 double blocks, 24 standard blocks and 4 standard slopes. We always aim to have plenty of stock but very occasionally we do have periods where we are waiting for a consignment to arrive, which can be up to eight weeks. If we are out of stock and you can't wait then we can supply the standard 84 piece boxes which include the double slopes at the same price. Please complete the 'order form' by 'clicking here'. Upon receipt of your order we will advise you of how to make payment which can be by bank transfer, cheque and debit card. Upon receipt of payment we will send you a VAT invoice and you order will be despatched immediately. 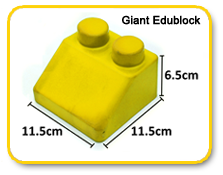 For some questions and answers about Giant Edublocks please click here.